Late last night, after spending an hour cleaning up Annabel's vomit from her bed and every other place between her bed, the bathroom, and the washing machine, I cozied up next to her on the sofa and decided I needed to do something fun before Brian returned from hockey. An amazing friend of mine, Jess, had recently emailed me a list of celebrities and their publicist's or agent's contact information. I figured, What the hell? I took the core of the email I had sent to Oprah, Ellen, and the Today Show the day prior and edited it a bit. Then I picked some of my favorite celebrities on that list and one by one, I hit Send. It was fun, really fun, and it's even more fun waiting for a possible reply. Your book sounds wonderful and we look forward to checking it out. At this time Kelly will not be able to participate but we wish you the best of luck with the launch. I was psyched!!! I mean, someone actually saw my email and replied!!! I tell this story as one example of lots of fun stuff that has been swirling around finishing my book and planning for the launch party in May. It's been one of the most exciting things I have ever done and I feel blessed every day to be doing it. But that's not what drew me to the "New Post" button tonight. Fernando Morales was 20 years old when he died of cancer last Friday. Fernando lived in a town that borders mine, and I never met him. A dear friend of mine, Amy K, first told me about Fernando last September. As a Make-A-Wish volunteer, Amy had helped coordinate Fernando's wish to go to the Olympics several years ago. Amy cares about her "wish kids" (as she calls them) years after she makes their wish come true and it was clear that Amy loved Fernando. Somehow, Amy even discovered that there was a yard sale to benefit Fernando's Jimmy Fund Walk team on the same afternoon that my fabulous friends, Erin and Katie, were holding a yard sale to benefit our team. Amy made up flyers to point our customers to Norwood for Fernando's team's fundraiser and we heard from several people that Fernando's team had sent them to Canton. Just before last year's walk, Amy told me that Fernando was going to be a Walk Hero for the second mile. When we reached Fernando's poster one mile into the 26.2 mile journey, I snapped a photo and texted it to Amy. 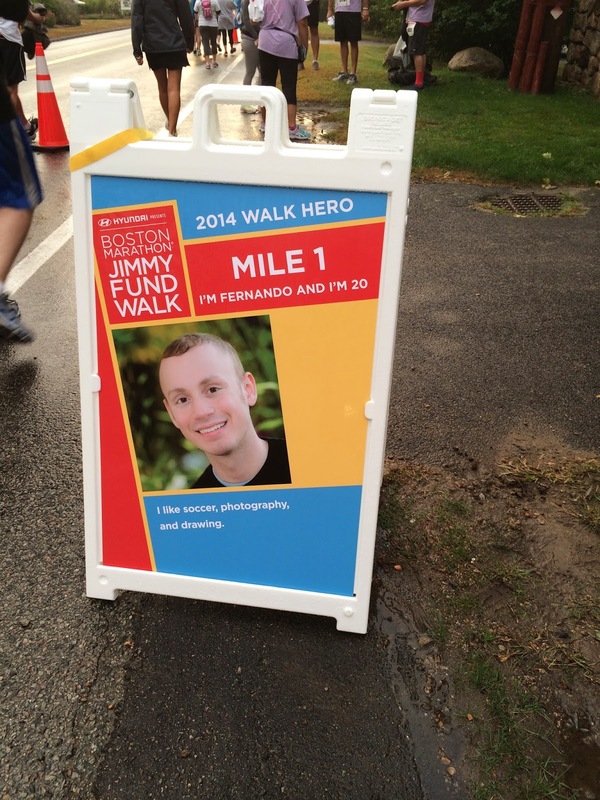 I thought about Fernando during that mile, just as I thought of each Walk Hero after I passed them. To be honest, however, I hadn't thought about Fernando since, until last Friday. Our paths never crossed in any other way and I just assumed he was doing okay. Maybe I had to assume that for my own well-being. Last Friday, Amy and I met with a wonderful Jimmy Fund Walk staff person (Nora) at Dana-Farber to discuss details of the book launch event. In an eerie and beautiful irony, we talked about Fernando and his sheer awesomeness. Some sick part of me wants to know whether Fernando had died already as we conversed about how amazing he "is." Nevertheless, this is not a post about Fernando. I really don't know enough about him to do his story any justice. To honor his legacy in a small way, however, I will provide you THIS LINK, which includes a video that captures a piece of Fernando's spirit. But then I will diverge, mostly out of respect for this young man. I know that sometimes cancer can look "fun." Chances to meet a celebrity or go to the Olympics or email Oprah and Ellen begging them to send me a "Hope is" video. Trust me, those things are fun and perhaps after cancer, they are cherished like never before. But amidst all the fun that gets photographed and put on posters and marketing materials, one must never forget the dark side of cancer (at least, that's what I'm calling it). The dark side holds the cancer world that rarely gets discussed in public, perhaps mostly due to the fact that those of us who have been there don't really want to describe it to those who have not. Believe me, cancer does not have a monopoly on the dark side. But it has a big, splintery stake in it. The dark side includes moments that don't get posted on Facebook, or even on a blog as open and honest as this one. The dark side includes difficult moments so seemingly random that we don't even want to own up to them. Moments like a few weeks ago when I took down our Christmas decorations and nearly burst into tears when I started to wonder if I would have cancer again the next time I took them out. Those dark moments are not easy and even now, two and a half years after my diagnosis, they still arrive at my doorstep when I least expect them. Obviously the lump in my throat while packing up our Christmas decorations is nothing compared to the tears that likely are flowing at the Morales home a few miles away. These are just two different corners of the dark side. And we must not forget them, nor the countless other corners that exist there. I needed to write tonight not only to grieve in a relatively small way, but also to bring myself back to basics. 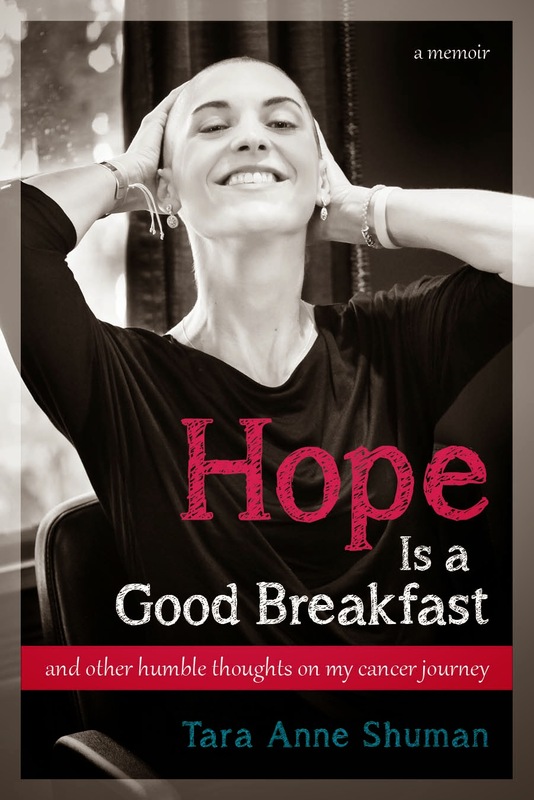 To remind myself why I want to raise $100,000 for the Jimmy Fund this year, why I want the book launch party (which proceeds will all go to the Jimmy Fund) to succeed in such a big way, why I wrote my book to begin with. Because while it's really fun to write to Oprah and Bruce and Ellen and hope they respond, in the end, what I want is something so much bigger. I want a cure to cancer. And I want it so badly that I can taste it in the tears that fell onto my keyboard as I uploaded the photo of a Walk Hero whom I never even met.